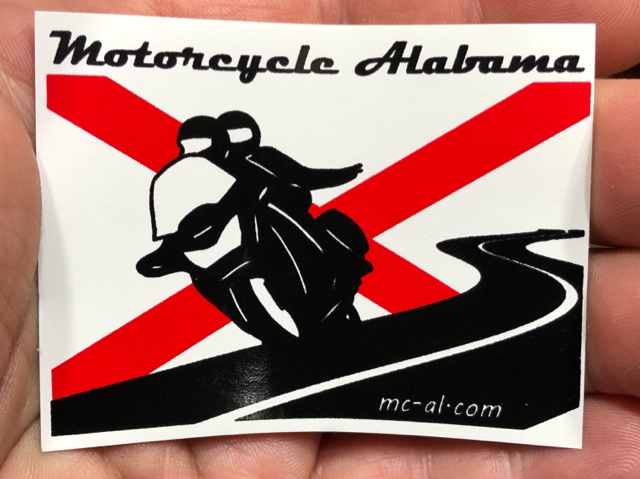 Welcome to the "storefront" for official Motorcycle Alabama swag. 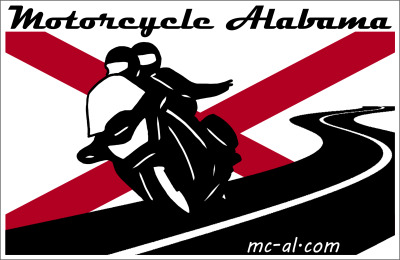 We hope to make available in the near future several MC-AL logo'ed items. 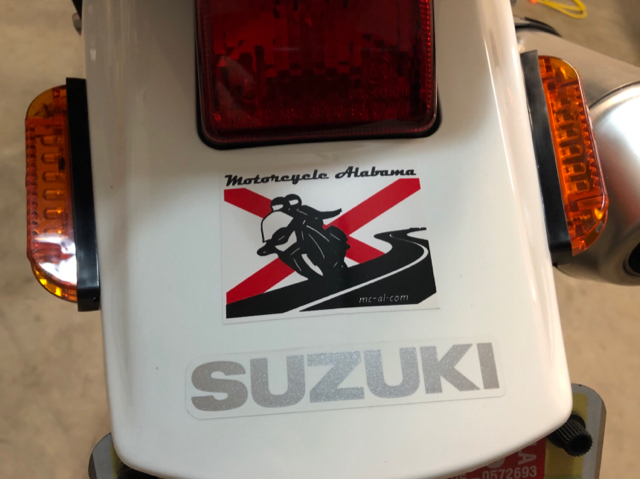 Money from sales goes to the Motorcycle Alabama forum account which helps fund signage, equipment and supplies for activities such as Vintage Fest, gymkhana events, etc. It also helps pay server/domain costs and other forum-related expenses. Purchasing MC-AL merchandise spreads the word about our community and helps keep the lights on. 1 Like Chuck & Susan likes this. New license plates are here! These are .040" aluminum w/ ink screening (not a decal). Price is $15 ea. / $25 for two...this will include shipping to the lower 48 (others will add shipping $$) for this initial batch. To order, send me a PM. I can take Paypal Friends & Family (no fees on my end), or you can snail-mail a check. If you're in the metro B'ham area, I can take PayPal and drop it at your house/work, etc. or we can meet face-to-face and swap cash for a plate. 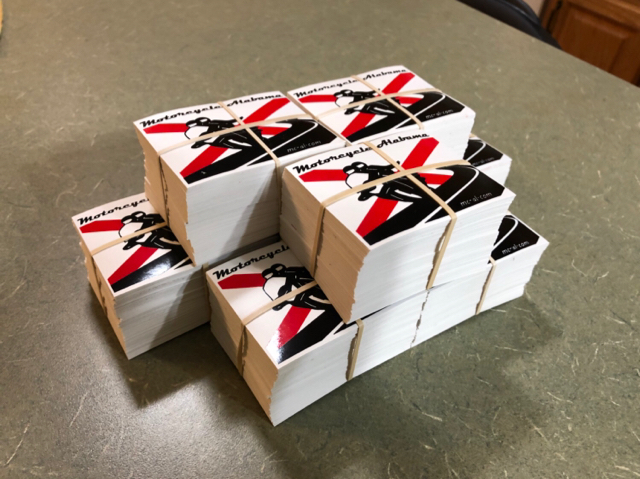 Each order will include a stack of MC-AL business cards. Hand them out to other riders you meet, stick 'em in your spokes, hang them on the Christmas tree...the uses are endless! 3 Likes springer, Chuck & Susan and Nice Goat like this. Mulley has created a Zazzle link that will allow you to purchase t-shirts, hoodies, long-sleeve shirts, polos, raglans, etc., using a black logo, which is better for light-colored clothes. Just select the style, color, and size you want. Do not balk at the prices. Zazzle is always offering 25-30% off. Just use the promo code. 2 Likes KevinB and Chuck & Susan like this. Mulley has created a Zazzle link that will allow you to purchase t-shirts, hoodies, long-sleeve shirts, polos, raglans, etc. Just select the style, color, and size you want. I will be adding more styles to this page. Sorry I'm running behind on this. Expanding on what Mulley has provided, I created a Zazzle link that allows you to purchase clothing using a white logo, which is better for dark colored clothes. Just select the style, color, and size you want. The link says "t_shirt" but you can also order sweatshirts, long-sleeves, polos, etc. Need a big ol' cup of Joe in the morning? How about a 20-oz. coffee mug? Stickers are made from 10-year weather grade vinyl, red and black ink on a white background. And best of all... They are free! Staff will have them in their hands soon to hand out at events, rides, etc. 5 Likes KevinB, Fencejumper09, JBMFT, Chuck & Susan and Campbell92 like this.